As Dr. Keys warned Americans about the dangers of saturated fat, consumption of animal fats and butter declined. The main component of animal fats is saturated fats. Omega 6 fat content is vanishingly low. Both butter as well as beef tallow are similar in composition. Vegetable oils such as corn, by contrast have low level of saturated fats, but are very high in polyunsaturated fats, the majority of which is omega 6. There is virtually no omega 3 fats here. Going back to the Seven Countries Study, the emphasis of modern nutrition until recently was to replace saturated fats with polyunsaturates. This at first led to the explosion of trans fats. Once that danger was recognized, it no longer appeared that saturated fats were dangerous at all. Over the ensuing decades, the consumption of animal fat continued to fall. After remaining stable from 1900-1950, it began a relentless decline under government exhortations to reduce saturated fats. The dialogue began to change beginning in the late 1990s due to popularity of higher fat diets such as the Atkins diet. Indeed, Dr. Atkins wrote in the “New Diet Revolution” that, “The thirty-year-long campaign against dietary fat is as misguided as it is futile”. True that, Dr. Atkins. True. That. As he pointed out on his website, all foods contain all three types of fat – saturated, monounsaturated and polyunsaturated. The proportions of the three do vary. The unintended consequence was that intake of omega 6 oils increased significantly. To be more precise, this was the intended consequence. It was unintentionally detrimental to human health. Omega 6s are a family of polyunsaturated fats. These fatty acids are converted to eicosanoids such as prostaglandins and leukotrienes. These are highly inflammatory mediators. This is not good. Atherosclerosis, or the buildup of plaque in the arteries was originally considered to be cholesterol sludge depositing in the arterial walls. This has long been known to be untrue at least since the time I was in medical school in the early 1990s. The pathophysiology of atherosclerosis is mainly dependent upon inflammation and thrombosis in the wall of the artery. The sludge deposits as a ‘response to injury’. Thus the plaque is the response to the inflammation. The real problem is the inflammation. Increasing inflammatory molecules could conceivable contribute to worsening heart attack and strokes. Omega 3 fats tend to oppose the effects of Omega 6 fats and therefore increasing attention is being paid to the ratio of these fats. Vegetable oils have extremely high Omega 6:3 ratios. It is estimated that humans evolved eating a diet that is close to equal in Omega 3s and 6s. However, the current Western diet is estimated to be closer to a 15:1 ratio. Either we are way under eating omega 3, way over eating omega 6s, or more likely, both. Omega 3 fatty acids decreases thrombosis (blood clots) by its role in platelet aggregation, bleeding time and blood viscosity. Low rates of heart disease were originally described in the Inuit population, where, despite high intakes of fat, they had very low rates of heart disease. Subsequently, it was found that all major fish eating populations tended to have lower rates of heart disease. Additional studies seemed to confirm that addition of omega 3 to the diet could displace the omega 6 from cell walls. However, this will be very difficult if the ratio of Omega 6:3 is 30:1. The massive increase in consumption of omega 6’s in the diet can be traced to technological advances in the 1900s that allowed modern methods of making vegetable oil. 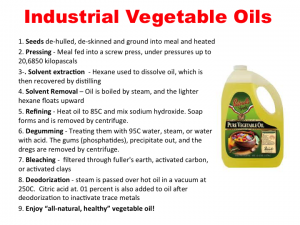 The invention of the continuous screw press (Expeller), steam-vacuum deodorization and solvent extraction techniques were critical to the production of vast quantities of vegetable oils. Another culprit is the rise of the industrial farm and the feedlot cattle. Wild animals tend to be very lean, and contain high levels of polyunsaturated fats. Feedlot cattle, however, are fed grains at every turn. Indeed, there is nothing for the cattle to do all day, but eat. Cows, of course, are ruminants and designed to eat grass. Feeding them corn does wonders to fatten them, but increases omega 6 content of their meat significantly. So our grains, our meats, and our oils are omega 6 based. This all contributed to the massive imbalance in the Omega 6:3 ratio. The Canadian nutritional guidelines were the first in 1990 to recognize the difference and include specific recommendations for both types of fatty acids. The other consequence of the scare about animal fats was that America increasingly reached for that tub of edible plastic – margarine. With large advertising budgets designed to play up its wholesome all-vegetable origins, trans fat laden margarine has always professed itself to be a healthier alternative to butter largely based on its low saturated fat. Margarine has an interesting history. Designed by a French chemist in 1869 as a cheap butter alternative, it was originally made from beef tallow and skim milk. A Dutch company, eventually absorbed into Unilever bought the rights and proceeded to market the new substance. Margarine is actually an unappetizing white, but since it was designed as a butter alternative, it was dyed yellow. Butter manufacturers, though were not amused. 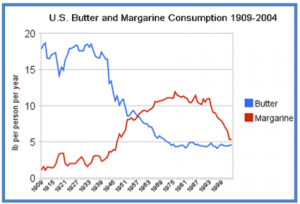 Using taxes and laws against dying, margarine was a marginal product for decades. Its big break came with World War II and the ensuing butter shortage. Most of the taxes and laws against margarine were repealed since butter was scarcely available anyway. This paved the way for the great margarine renaissance in the 1960s and 70s as the war on saturated fats gained ground. It is ironic that this ‘healthier’ alternative turned out to be chalk full of trans fats that were, actually killing people. Thankfully, most manufacturers no longer make margarine with trans fats and have tried to blend more healthful ingredients like olive oil in. Thus, where previous studies had linked margarine use to heart disease, it is questionable whether modern studies will still show this effect. However, it still doesn’t change the fact that butter just tastes way, way better. It’s actually a minor miracle that vegetable oils were considered healthy at all. Consider the substantial amount of processing – pressing, solvent extraction, refining, degumming, bleaching and deodorization – that is required to squeeze the oil from a non-oily vegetable such as corn. There is virtually nothing natural about it. It could only have become popular during an era where artificial was considered good. Artificial orange juices like Tang. Baby formula. Jello. Canned soups. This was a time we considered ourselves to be smarter than Mother Nature. Whatever she had made, we could make better. So out with all natural butter. In with industrially produced, artificially coloured trans fat laden margarine! Out with naturally produced lard from pigs. In with industrially processed, solvent extracted, bleached and deodorized vegetable oil! What could possibly go wrong? Start here with Calories I – How Do We Gain Weight? We have been using peanut oil for cooking, along with olive oil, because the taste of olive oil is not always suited to a particular recipe. It’s my impression that peanut oil is a more natural product than the alternatives (canola, sunflower…) because peanuts are naturally oily and their oil doesn’t have to be aggressively extracted with solvents, like the example above. I would like to know about peanut oil, too, for deep frying. Is it heathful to use? Are all peanut oils the same? What do you think about Ron Taylor from Newcastlen and his starvation diet and diabetes. His theory is that fat is clogging up the pancreas and liver, and if all this visceral fat is removed, the betacells will start functioning again.His diet is about 600 calories a day though, but does not the fasting thing work in the same way, and is much more effective btw? In sentence “Using taxes and laws against dying, margarine…” word dying should be changed to dyeing. Enjoying your work thus far. Then, not two pages later, you go into stress hormones. I should read the whole thing before commenting, shouldn’t I?